On 1st February 2018, AMDA signed a MoU (memorandum of understanding) with the United Nations Relief and Works Agency for Palestine Refugees in the Near East (UNRWA). Since May 1950, UNRWA has provided support and protection to some 5.4 million Palestine refugees in Jordan, Palestine (the West Bank, including East Jerusalem, and Gaza), Lebanon and Syria. UNRWA operates 143 health centers in the said five areas. More than 99% of the UNRWA staff are Palestine refugees themselves. 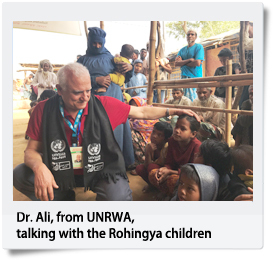 UNRWA's Director of Health, Dr. Akihiro Seita sent a message to AMDA in December 2017 asking, "Doctors who were raised in the Palestine refugee camps wish to provide medical support to Rohingya refugees. Would it be possible for them to work with AMDA?" As a medical student, Dr. Seita was an active member of AMSA (Asian Medical Students' Association). As AMDA and AMSA were both founded by Dr. Shigeru Suganami, Dr. Seita had previous experience working with AMDA. 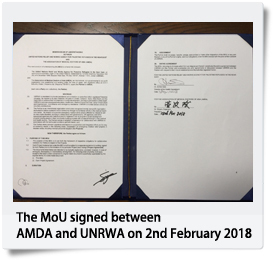 Dr. Seita's tremendous request reflects these principles perfectly, and so the process towards the establishment of the MoU between AMDA and UNRWA began. 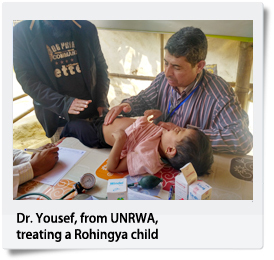 "A split image of the Palestine refugee camp that I grew up in"
Following the signing of this MoU with UNRWA, two doctors from UNRWA, along with a Japanese nurse, went to the Rohingya refugee camp in February 2018. 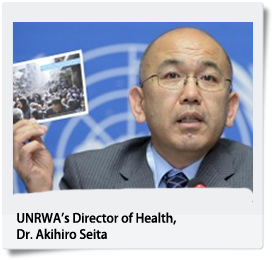 The two UNRWA doctors have both lived in a refugee camp in the past as Palestine refugees. The two doctors felt that it was their duty to help the Rohingya people overcome such difficulties that they had once experienced themselves. The doctors were stunned at the sight of the Rohingya refugee camp as it reminded them of the camps they grew up in as children. While making the most of their experiences, the two doctors closely listened to and cared for the patients, understood the medical conditions of the camp and were also involved in health data analysis. 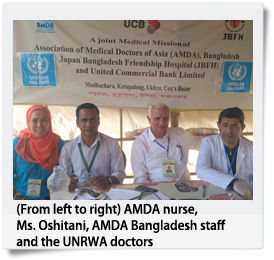 The following is a summary of the report by the Japanese nurse who joined the two UNRWA doctors at the Rohingya refugee camp: I was able to speak with many of the refugees living in the camp. Before talking with them, I expected that there would be various requests to improve the sanitation and hygiene of the camp. Contrary to my expectations, they were glad to have escaped the fear of being attacked and that they are now able to live in the camp safely with their families. They were happy to be able to take refuge in the camp regardless of its conditions. Wondering why my expectations were so different to how the refugees actually felt, I asked one of the UNRWA doctors. While thinking back on his own experiences, he told me "In a person's life, safety is paramount. Once your safety is assured, then you can begin to worry about the way that you live and your surroundings." I was astonished to realise that, even though they are living in such poor conditions, conditions that we in Japan could never even imagine, the refugees thought of the camp as a place where they can live safely with their families. I started to realise that we often take our safety for granted in our everyday lives and how much it influences the way we live. That I could directly talk with and even understand the refugees was all owing to the fact that the UNRWA doctors were there with us. I am truly grateful for having had the opportunity to work with them. AMDA believes that, in order to effectively make widespread and comprehensive contributions to peace, it is crucial to cooperate with various partners. Based on this idea, AMDA has formulated a support program called "Global Partnership for Sustainable Peace" (GPSP), which consists of four categories ? peace building, health development, educational support and livelihood support. AMDA is certain that this cooperation with UNRWA, which also pertains to GPSP, will not just be of great benefit to all other groups involved, but will more importantly be greatly beneficial to those who need assistance.